Humor, actually, has a large place in Essen's games. "I try not to make them too serious," he says. But the humor is sometimes (read: often) black. Take his most recent game, The Thrill of Combat. One player flies a helicopter around a color-throbbing environment, while the other uses a laser to destroy enemies. But the true goal of the game is using the laser to harvest organs from humans on the ground, complete with an Operation-style mini-game. In any other setting, it would seem overly dark and disturbing, but the humor makes it work. The Thrill of Combat was released for download a few weeks after its debut at the recent "Welcome to the Terrordrome" exhibition at the Museum of Contemporary Canadian Art. "Museum?" you ask? Did I forget to mention that Flywrench is being displayed at New York's prestigious New Museum of Contemporary Art until July? Essen, in fact, designs many of his games for gallery settings. (So much for the can-games-be-art debate.) For them to succeed in such a setting, though, Essen has to make specific design decisions. "They're able to be played without a lot of introductory levels and clicking around," he says. "One person can play, another can play right after that. Maybe something happens if no one's playing." "You also have to think about how the game is displayed, like as a huge projection or whatever, the sound, etc. With The Thrill of Combat, I set it up for two players with a steering wheel, pedal and a joystick in front of a big projection. When you're playing, you sit so close to the screen that it fills your whole view. It's flashing and rotating, and you're trying to tell your partner what to do, and to anyone watching it seems pretty chaotic. But the wheel's angle is tied directly to the rotation of the screen, so if you're sitting on that control bench, it makes a lot more sense." 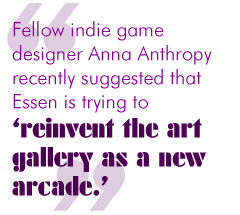 Fellow indie game designer Anna Anthropy, aka "auntie pixelante," recently suggested that Essen is trying to "reinvent the art gallery as a new arcade." Indeed, Essen hopes to find a more permanent space for these kinds of games. "I've talked to a few people that are on the way to setting something like that up, and I think there's an audience for it," he says. As for what he's up to now, he tells me about two of his new games. One "takes place after a king dies, and you run around a castle and hunt down everyone that stands in the way of you getting yours, all with gentlemanly sword fighting." In the second, "you build and fly a plane from island to island transporting goods, but when you crash you have to pay for repairs and go into debt, so you sort of get stuck working between two islands, because your plane is too crappy to go any farther. It's an exploration game without the exploring, because you're too in debt." An exploration game without the exploring? Sounds good to me. John Adkins is a freelance writer who enjoys playing weird indie games, particularly when those games are by Mark Essen. He can be contacted at johnadkins256[at]gmail[dot]com.